A Christian poem for Mothers day is a lovely way to show your faith particularly on these special occasions that mean so much to us as families. Christian poems can bring comfort in times of hardship and also when you need some uplifting so it's a perfect fit when it comes to expressing your thanks to the one woman who has always put you first. To me there is nothing more special than showing your mother how much you love and appreciate her by giving her something that is from the heart and something that you also put a lot of time and care into. This gift is a way to not only incorporate your faith but also your creativity. To start creating your Mother's Day gift, you need to find the right poem that really suits the way you feel about your mother. I'm not much of a poet so I used the internet to do a search and find what I wanted to say. This particular poem really spoke to me, so I chose it for my purpose, but you might find something that speaks more to you. Maybe you'd even be able to write your own. Give it a try and see if you can come up with something special. As a child I would say, "Mommy, I Love You." These words describe perfectly how I feel about my own mother and how she really is a gift to me from God. You could simply print out this Christian poem for Mothers Day as a nice gift on its own, but there is also plenty of opportunity to get creative with it. Creative Mother's day ideas are many so feel free to do what you like but here is one Mother's Day idea that I think would be extra special. 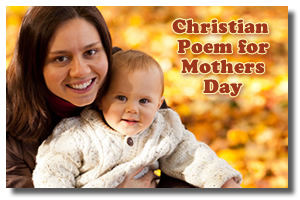 Print the Christian poem for Mothers day of your choice on special paper, you can go with floral or plain, whatever theme you wish. At your local craft store you can find shadow boxes for reasonable prices but make sure you pick the right size depending on what you are putting in the box. The backdrop to your shadow box should be the printed poem, and from there it's all up to you! I like the idea of incorporating childhood pictures and silk flowers because shadow boxes really are blank canvases to build the perfect gift in. The end result will be something very special for your mother that you can really take pride in presenting to her. I think a great religious poem for Mothers day is an amazing way to show your faith and respect but above all you should mean every word. For me, there aren’t enough words in this world to show my Mother my appreciation!